With the costs of going to college rising every year faster than inflation in the United States, more and more college graduates are leaving school with thousands of dollars in student loan debt. According to a report from the Institute for College Access & Success over 60% of college graduates in 2011 held an average of $26,000 in student loan debt when they graduated. That is an increase of 5% from the student loan debt level in 2010, and it is the highest level of debt in the last seven years. Student loan debt for borrowers under 30 years-old has almost doubled since 2005 according to the Federal Reserve Bank of New York. Student loan balances for those students and former students has now topped $292 billion. The average student loan debt for those under 30 years-old has grown 56% since 2005 to over $20,000. The other half of the equation is that the job market still is not as strong as it needs to be for the graduates looking for a job. Despite the economy and the job market showing signs of improvement, graduates are still finding it hard to find a good paying job. Of course, the lack of good paying jobs are putting pressure on former students and their ability to pay back their student loan debt. If you are finding yourself struggling to make ends meet because of your student loans, there are several steps that you can to take to get started tackling your student loan debt. The first thing you need to do is get organized in order to tackle your student loan debt in the most efficient manner. You probably have different student loans from each year of college, and you possibly more student loans from different schools if you transferred. Or, you could have a combination of subsidized or unsubsidized student loans. You should take all your student loans and lay them out in a spreadsheet so that you can see the balance, interest rate, and monthly payment for all of your student loan debt. That way you can start to understand each loan. There is a great benefit to looking both at a micro and macro level. Not only do you need to understand each of your debts but also how they all interweave into your entire debt picture and your net worth. Even though you probably just graduated from college, you should be tracking your net worth. You should also look at what type of student loans they are so you can see if you qualify for any special programs. 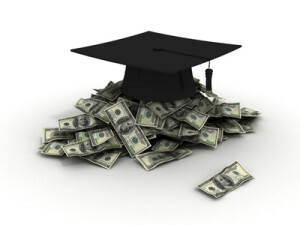 Once you have laid all of your student loan debt all out, it is important to set up a plan to pay them off. Most people will say to start with the highest interest rate and work your way to the lowest interest rate. That is smart economically, but psychologically you may want to pay off your smallest loans first to get some mental “wins” under your belt. This is exactly what Dave Ramsey recommends and talks about in his bestselling book, “The Total Money Makeover “. You could also consider consolidating all of your loans into one loan but only do that if the total interest is better than all of your individual loans combined. Be sure to check out how you can receive a free copy of Dave Ramsey’s book from Money Q&A. Finally, once you have a plan, you should automate the plan so you are forced into paying you loans off with as little involvement from you every month. The more that you have to complete an action will ultimately lead to you not paying that bill one month or choosing something else instead. This is one trick that you can use to also keep a New Year’s Resolution too. Setup an automatic bill pay or direct debit. That way your monthly payments are automatically taken care of. This will help you get the loans paid off, and also prevent you from accidentally missing a payment and possibly defaulting on a loan. It can also be a way for you to set up additional payments and payoff your loans even faster, becoming debt free. More and more college students are struggling with student loan debt. And, to make matters worse, the economy which continues to struggle and the unemployment picture in America are not making it easier for recent college graduates. There are a few things that students who have graduated with student loan debts can do to get ahead of the debt and start paying it off. Are you struggling with student loan debt? What have you been doing to payoff the debt? I’d love to hear from you in the comment section below. Thankfully we got my loans paid off last year, it was a great feeling. I think having them consolidated with a lower rate was a huge help for us. I realize now that I have taken for granted the incredible fortune that I’ve personally had in not having to take out any student loans for my degrees. I was bless with scholarships from the government, but of course I had to pay them back with time served though. Drowning in student loan debt is an understatement. What if the amount is so high and the interest is so much that it seems hopeless? Wow! That Instagram picture that people can click through when they click your name above is amazing Katey. What is / was your degree in where you accumulated all of that debt? Hi Hank, thanks for writing this article. I agree that organization is a great place to start. I would add *speaking with a student loan consultant* to your list. Folks like me understand private & student loans inside out, and have a thorough knowledge of personal finance issues. Chatting with an expert would give hopeless borrowers like Katey (and millions of others!) plenty of hope, guidance and clarity re: their student loans. After all, student loans (especially federal ones) tend to be more forgiving & flexible in repayment options than other loans like mortgage loans, auto loans and etc. Again, there is plenty of step-by-step assistance available out there if you’ll venture into the internet to seek it.